Well here we are in the grips of Eid and people are in food induced coma's all over the place. 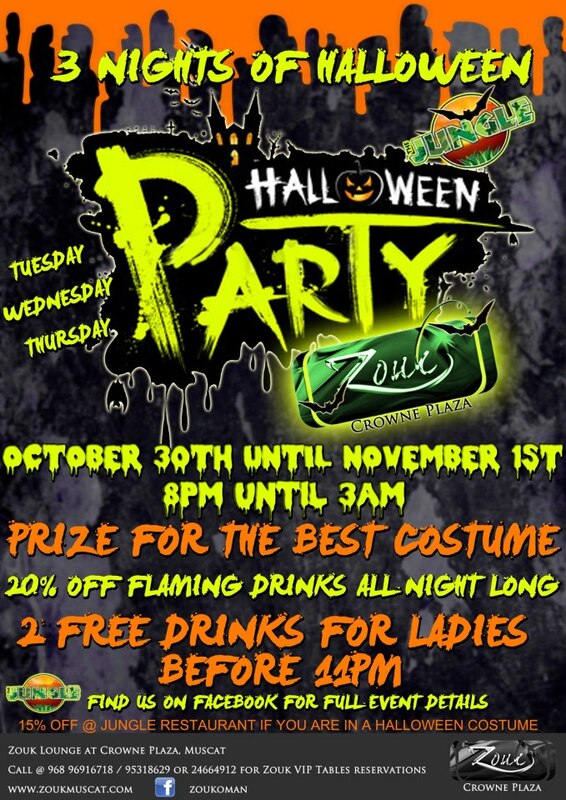 There's plenty of Eid parties going on all over the city, and now we have Halloween coming up on the 31st October, a Wednesday, which is handy. 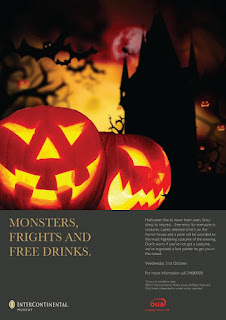 Here's a round up of the gigs that I'm aware of for halloween around the Capital. If you want me to add your event, please email me, my email address is on the top right corner of this blog where the disclaimer is. First up, the Al Ghazal at the InterCon has an offering of free entry, face painters, free selected drinks for the ladies and a prize for the best costume. Here's the Facebook event page. 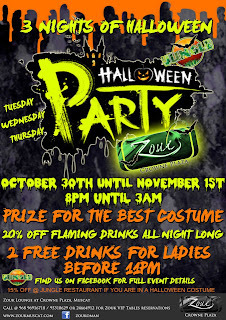 Next there is Zouk offering up 3 nights of madness for Halloween... starting on Tuesday and running until Thursday, 20% off all flaming drinks and 2 free drinks for ladies before 11:00pm. 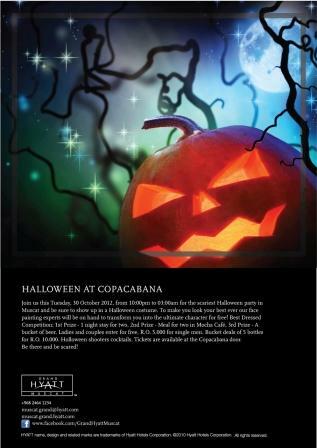 And finally the Hyatt are having 2 Halloween events, one on Tuesday the 30th at the Copacabana and one on the 31st at the Safari pub, along with the hugely popular and back again for another year: Oktoberfest, which starts again this year on Tuesday 30th and runs every day for 8 days. More on that later. The Copa event is on Tuesday night and features free entry for women and couples, a fiver for single men. A bucket of 5 beers for RO 10, face painters on hand to help you get into character (who I assume will be working at the InterCon the following night). There are prizes for the best dressed: 1st is a weekend stay at the Hyatt, 2nd is a meal for two at the Mocha Cafe and 3rd a bucket of beer. 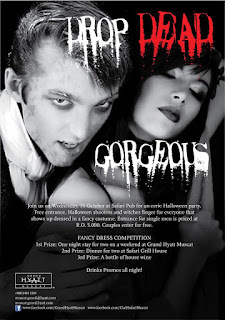 The Safari Pub Halloween party is on Wednesday 31st and everyone in costume gets free entry, as well as couples. Single men pay cover charge of RO 5. Prize on offer are: 1st: weekend stay at the Hyatt, 2nd: dinner for 2 at the Safari Rooftop Grill and 3rd: a bottle of house wine. Judging by how packed Safari is most weekends, I'm going to say that this will be the best-attended Halloween party in town. Here's the facebook event page. It appears that there is no news from the management at O'Malleys, the Irish bar in the basement of the Radisson, but I imagine they will have something lined up. Here's their facebook page incase they update it with something relevant. Nuts & Bolts have also not updated their facebook page with any Halloween events yet either, but heres the link in case they do. Any news on the shortage of fuel across Oman? No idea - I filled my tank up yesterday with no problems. Any idea where to find Halloween costumes for adults? Seen some accessories at TSC and Lulu's, but as for full costumes, no. There was a fancy dress rental shop, I'll get the details and blog it if it's still in business. On 26th evening we also face the shortage of fuel in Oman oil gas stations across Oman.